Ever been in a situation where you can’t decide what to wear? All the time? What you need to do is add single pieces of clothing to your wardrobe that act as the ideal base for the rest of your outfit. To put it simply, find clothes that go well with anything. It’s difficult, not to mention frustrating, for guys to find out what’s in style, how to match it with other items. Sometimes it’s a nightmare deciding what to wear on a particular occasion. But if you include these items in your wardrobe, dressing casually will be a breeze. A pair of black jeans is the most versatile piece of clothing you will ever own. You can wear it in practically any situation! Going for a party? Slip on a polo T-shirt and black jeans. Meeting a couple of friends for a beer? Wear your black jeans with a contrast tee. Planning to rob a bank? Black jeans, a black sweater, and a mask would look great. Whatever the occasion, a pair of black jeans is the ideal base to accentuate your look. Let’s face it, everyone looks great in a grey sweater. It’s especially useful when you’re just lounging around, because that’s when you’re more relaxed and tend to end up looking shabby. Ditch that old sweatshirt with the name of your college emblazoned on the back, and put on a grey sweater. It’ll lend an air of sophistication despite (or because of) it’s simplicity. A pair of chino shorts is the ideal fit for a warm, summery day. They’ll give you that minimalistic look, and they’re easy to pair with other wardrobe pieces. They’re especially great if you’re looking forward to a bit of physical activity in your day. Comfortable and cool, this piece looks great with almost any kind of clothing, especially a sweater in muted tones or a bright hued polo t-shirt. 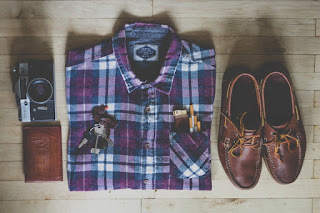 Make sure that you’ve got a checkered semiformal shirt in your collection of clothing. You can always wear one over a t-shirt and leave the front open. It’ll add a splash of colour to your outfit and give you that preppy, athletic look. You could even wear it with your black jeans for a more formal look, or with a pair of beach shorts when you’re visiting the beach. It’s versatile and will add a hint of colour and interest to any ensemble. For the final addition to your wardrobe, you’ll need a pair of sneakers. It’s the best investment you’ll ever make, because sneakers can really elevate your outfit and give it an offbeat touch. They go well with trousers and shorts, and give you a more wholesome appearance. Whether it’s a pair of puma shoes for men or any other type of sneakers, you need to add a pair to your wardrobe. You can visit Rediff.com to find some excellent deals on sneakers. These are a few of the items that you can add to your wardrobe to ease your clothing decisions. They’re easy to couple with other items of clothing and will take your casual look to the next level.